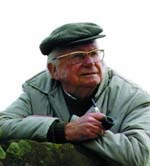 Alfred Wainwright is an unlikely hero but to many hillwalkers, his name is revered as the guru of Lake District guidebooks. Born to a poor Blackburn family in 1907, he first visited the Lake District as a 23 year old in 1930 and immediately fell in love with the district. In 1941, he took a job in the Kendal Borough Treasurers office, eventually becoming Borough Treasurer from 1948 until he retired in 1967. Following retirement, he set about writing his seven classic Lake District pictorial guidebooks, taking thirteen years to complete them. The manuscripts for these guidebooks were so meticulous and detailed that the printers simply copied his work, there was no editing required. At first glance this may not seem very remarkable but when you stop and really study these books, you realise that everything seen on the pages is handwritten and drawn, including all of the maps, drawings and script. Every page also finishes with a full-stop, no text carries over to the next page. In my opinion and that of many others, the books are simply works of art and for his efforts AW, as he is commonly known, was awarded the MBE. Following the success of the guides, AW then turned his attentions to the new long distance path The Pennine Way and produced a similar guide for the walk. His experiences along the newly inaugurated trail weren't the happiest and he spent most of his time getting stuck in bogs and drenched in the constant rain. Having completed the walk, he decided to have a go at devising his own long-distance route and in so doing, created 'A Coast to Coast Walk' in a similar format. By laying a ruler across a map of the UK, he decided on a walk from the Cumbrian coast at St.Bees, near Whitehaven to the North Yorkshire coast at Robin Hoods Bay, near Whitby. In doing so, the route passed through three National Parks, The Lake District, Yorkshire Dales and The North York Moors. The 190 mile route, which is extremely varied in scenery, quickly became popular and although it is an unofficial trail (it isn't even waymarked in the National Parks) has become probably the UK's most popular and best loved walk. It was recently the subject of a television programme starring Julia Bradbury, which greatly increased it's popularity, and was voted the 'second best walk in the world'. Having walked it again for the second time, for me, it's the best.